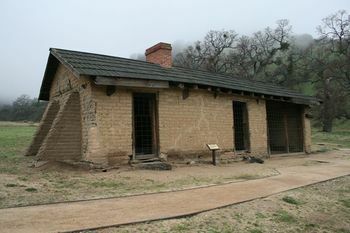 Fort Tejon (1854-1864) - First established 10 Aug 1854 during the California Gold Rush by 1st Lt. Thomas F. Castor (Cullum 1299) and Company A, 1st U.S. Dragoons in Kern County, California. Abandoned in 1864. Built as a small adobe post to replace Fort Miller. The mission was to control the Indians on the Sebastion Indian Reservation and to guard the Tejon Pass in the Tehachapi Mountains. More than 40 military buildings were built and a small community formed to the south of the post. The fort was initially garrisoned by Company A of the 1st U.S. Dragoons who were later joined by Company H and I. The average complement was about 225 men. The 1860 Census listed 960 soldiers and civilians in the community. 1st Lt. Thomas F. Castor, who initially established the post, died at the post 8 Sep 1855 and is buried at the Fort Tejon Military Cemetery along with 7 other souls. In 1857 the fort was severely damaged by one of most severe earthquakes to ever hit California. In late 1857 Fort Tejon received a number of camels as a part of an experiment to determine their usefulness in the southwest; in 1861, the herd of camels, then numbering 28, were turned over to the Quartermaster of California. Fort Tejon was abandoned 15 Jun 1861 by regular Dragoons who were withdrawn to Los Angles as the U.S. Civil War began. The post was regarrisoned by California Volunteers on 17 Aug 1863 and abandoned finally 11 Sep 1864. 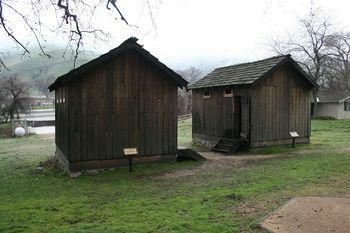 Fort Tejon State Historic Park. Several reconstructed and restored buildings with period displays. Location: Tejon State Historic Park, Kern County, California.